As part of ongoing operational deployment of the Indian Navy’s Eastern Fleet ships to South East Asia and North West Pacific region, three Indian Naval Ships Sahyadri, Shakti and Kamorta under the command of Rear Admiral Dinesh Kumar Tripathi, Flag Officer Commanding, Eastern Fleet shall be making a port call at Tien Sa Port, Danang from 21-25 May 2018. During the visit, there would be professional interaction between personnel of both the navies, official calls and interaction with dignitaries of the Vietnamese Government. Visits by local populace, guided tours for Indian Naval personnel, sports events and a band concert by Indian Navy band is also planned. 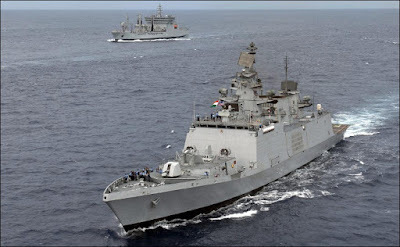 On completion of the harbour phase, both Indian Navy and Vietnam Peoples’ Navy would be undertaking an exercise. Bilateral relations between India and Vietnam are characterised by strong bonds of friendship based on cultural, religious and economic ties dating back to 2nd Century AD. The influence of Indian civilisation speaks of the deep rooted historical linkages between the two nations. India-Vietnam relations have been strengthened in recent years due to a vibrant economic relationship and growing convergence on security issues. In 2016, during the official visit of Indian Prime Minister, Mr Narendra Modi to Vietnam, the relations between the two countries were elevated to the level of Comprehensive Strategic Partnership. Visit by Prime Minister of Vietnam, HE Mr Nguyen Xuan Phuc to India in January this year as a guest for the Republic Day and for the ASEAN-India Commemorative Summit and a State visit by the President of Vietnam, HE Mr Tran Dai Quang in March 2018 signify momentum of the bilateral relationship. Strong defence cooperation is a vital component of the Comprehensive Strategic Partnership between the two countries. The Indian Defence Minister is scheduled to visit Vietnam in June this year and the Chief of General Staff of Vietnam People's Army and the Commander-in Chief of Vietnam People's Navy are scheduled to visit India later this year. The Indian Navy has had extensive interactions with Vietnam People’s Navy, particularly in the field of training, repairs, maintenance and logistics support aimed at capacity building. The last visit by Indian Navy ship to Vietnam was in Sep 2017, when two of its ships INS Satpura and INS Kadmatt visited Hai Phong port. The current visit seeks to enhance maritime cooperation between the two Navies and will further bolster the strong bonds of friendship between the two countries and contribute to security and stability in the region and the world at large. Based on the meeting convened by Raksha MantriSmt Nirmala Sitharaman with Members of Parliament and elected Vice Presidents of all 62 Cantonment Boards on 04 May 2018, on the issues relating to Cantonments, a detailed review was undertaken by the Ministry on various issues, in particular those relating to closure of roads in the Cantonments. The Raksha MantriSmtSitharaman has also reviewed the matter with Chief of Army Staff General Bipin Rawat, Defence Secretary Shri Sanjay Mitra and senior officers of the Ministry.